Cut to the chase with this accurate, consolidated database of barbers, hair stylists, beauty shops and those in the cosmetology industry with this pre-built, accurate data product from Bookyourdata.com. Find beauticians who may be interested in your products with our email list now! Beautify your B2B marketing campaign with this clean, verified data, pulled into one organized, consolidated directory. Find a spread-out and often-sales-generating group: hair stylists. Purchase a vast directory of the key contacts at these businesses and start reaching out to them right away. 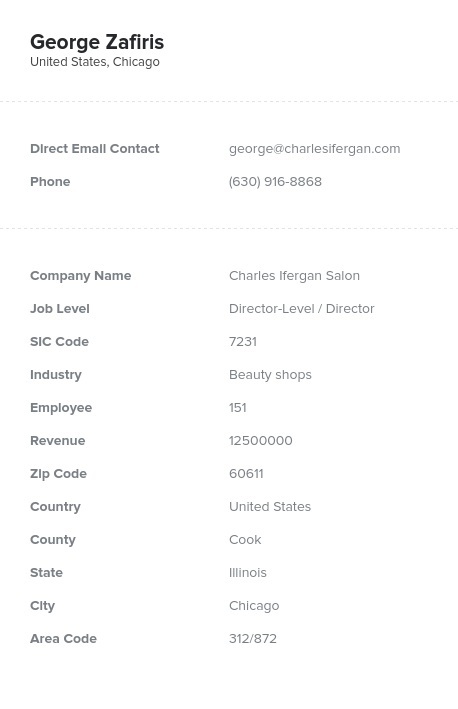 You can buy, download, and integrate this hair salon email list into your CRM within minutes. Then, you can start connecting at no extra cost. This directory of your niche audience is perfect for a variety of marketing efforts, from offering magazine subscriptions to showing off a new beauty product line to marketing your beauty event. If you want to market to a niche audience of small businesses, then pull this data product now. Show your company's products or services off to a diverse array of hygiene, beauty shops, hair salons, hair dressers, hair stylists, and barbers with this pre-built list, which is ready for you to download and use now. Or you can also find others within your niche with the custom list-builder tool. Style your lead list so that it fits your B2B strategies, and market to the people who would be the most likely to buy your product. Market to hair salons and barbers with this data product today!